Forrest ‘On the Nullarbor’ is strategically located on the east west air route to meet all your aviation refuel needs, and its resident managers would be pleased to book your accommodation in one of the six cottages if an extended stay is required. The airport is an integral part of the township of Forrest 6434, located 88km west of the WA/SA State border, adjoining the Trans Australia railway. It exudes the essence of the Nullarbor, yet delivers modern comfort and facilities that include Telstra mobile communications. Avgas and Jet A1 aviation fuel is available, both bulk stored in 55,000 Litre above ground tanks. As weather may affect access track conditions for road supply there can sometimes be a product delivery delay. Hence, it is highly desirable that prior notice for refuel requirements be phoned ahead. Pressure refuel is available for Jet A1 customers requiring this delivery mode. If you are a surface traveller and enjoying the outback track experience, make Forrest your stop over for diesel or unleaded and revitalise at a camp site or cottage with its self contained facilities. 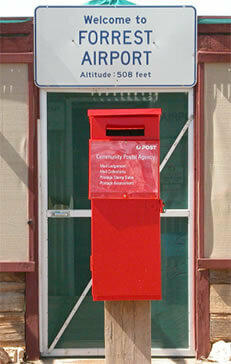 Welcome to Forrest ‘On the Nullarbor’, established and continuous in time since 1929.